The push is to turn over genuine control to the community, to let people work live without a net. It’s about trusting you, and it’s about welcoming you. So please, come and edit. If journalism does not work the same way as online encyclopaedia assembly, maybe it’s time to change how journalism works (this was the most popular form of objection, framed by @hubert_misztela). If people can collaborate on and deal with bias related to an encyclopaedic entry, then they can also collaborate on and deal with bias mitigation around a new article. (Wikitribune’s) method may be particularly subject to transparency and accountability – and prove itself a worthy outlet. Online news also doesn’t work like offline news. So let’s see if this approach works better than the traditional newspaper approach. I have no problem with re-invention or experiment, let alone with improvement in journalism. Online is an engine of opportunity and one of those new possibilities is widening participation in what were previously closed circles. Building a giant online encyclopaedia turned out to be something which could be crowd-made and Wikipedia (which I use frequently) is the result. Even Wikipedia quickly depended on a small core of dedicated writers and editors who made it their mission to keep the quality high. After a few stumbles, Wikipedia also discovered that avoiding embarassing scandals and mistake required editorial control and rules. Which, oddly enough, is what quality news media work with. The boom in disinformation has shown that a downside risk of online news is the difficulty of authenticating information. News is a magnet for bad actors. Wide open community participation risks being manipulated and gamed just as some mainstream media and platforms have been. Multiple authorship is simply not a guarantee against being played. It’s not the same as Wikitribune, but have a look at the struggle that has gone on at Reddit. Judgements about news need expertise and experience. Is the latest statement by Kim Jong-un a real change of policy or a diplomatic feint? How real is the risk that Italy might leave the euro? Is the source of the allegation we have just heard reliable? Contributions to news are not all equal. And, in news, decisions about which point of view gets priority may have to be taken very fast. Journalism has to be interesting as well as informative. Collectives and committees don’t do this well. The best journalism is often someone with something strong and original to say. 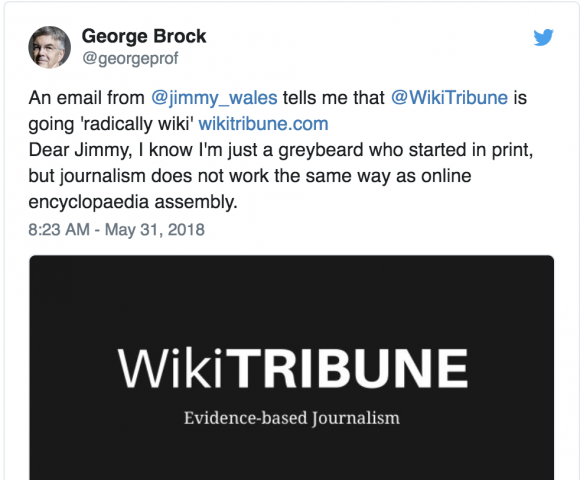 This may help explain Wikitribune’s low impact so far. Bias is not something easily identifiable which can be ironed out of journalism merely by procedure. All news and opinion destined for a large audience is the result of drastic selection. The selection depends on judgements. You can organise those judgements to be made by hundreds of people or by one. They are still judgements which are contestable. By all means make journalism more transparent (though please note that won’t be much help to investigative reporters), but their accountability should be to a quality standard in verifying, bearing witness, making meaning and digging out hidden facts. Trust is important, but it is not a useful test for the performance of journalists. Volunteers can contribute to news; so can expert knowledge and long experience. The process of news has already been radically changed online and the business model of mainstream media founded in print is in trouble. But is being accountable for chasing down the truth of what matters, journalism dioes not need rethinking. The harder problem is taking what has been good about journalism in an earlier technological era and making it work in a new age (an argument explored here). Journalism and the influence it can wield is so inherently contentious that people always dream that there exists a magic transformation which will fix it. Arrogance and misbehaviour by journalists feeds this illusion. The past two decades have seen unprecendented openings for new news media and some extraordinary new ways of doing journalism have been created which will last. But amid all this disruption, a significant number of high-calibre, mainstream news outlets have survived and even prospered. That suggests to me that not every aspect of journalism invented before the web deserves to be thrown away. Wikitribune wanted to start a ‘movement that we believe will eventually obliterate low-rent unreliable news for good.’ However much needs fixing in journalism, blind faith in the wisdom of crowds isn’t going to do it. This entry was posted on Friday, June 1st, 2018 at 6:45 am	and is filed under Experiments, Media Sources, Standards. You can follow any comments to this entry through the RSS 2.0 feed. Both comments and pings are currently closed.